RSS is an easy way to keep you automatically up to date on websites you like visit regularly. Instead of having to go to each website separately to see new stories, you can use RSS to view them easily in one application or program. 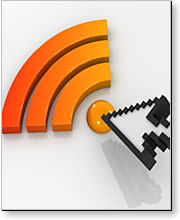 In general you need to install an application or program called a RSS Reader. RSS Readers displays the information from RSS feeds on your computer. Once you have a RSS Reader, you only have to choose which RSS feeds you want. There are a number of different News Readers available; click on this link to find links to the most popular products, many of which are free to install. How can I sign up to RSS feeds from SCEIS? When you see the "RSS Feed Available" link and the orange "XML" icon, you can use its link in your RSS Reader.